4 Shortcode Generate Pro Version. TC Logo Slider post type will show below POSTS . Download TC Logo Slider Pro(.zip file) from Purchase History . TC Logo Sliders post type will show below POSTS . TC Logo Slider post type will show below POSTS with its owl icon. I hope , you know how to add a post or a page in WordPress then it will be very easy to add a logo in your website. There are four (4) easy steps to complete the task. Company / Client Name (1) : This is self explanatory. Just add the name of Logo. Company URL (2) : Add Company Web URL in logo. Keep it blank if you do not want to add any URL. Logo Category(3) : You can categories your logo by creating your own category. Logo Image(4) : Add a picture of your logo ,Recommended size 180X96 px. Create a new Page / post where you will find the Owl Button To Generate short Code . Logo Admin Setting Option available only at PRO version. At Basic Settings instructions added with each field. 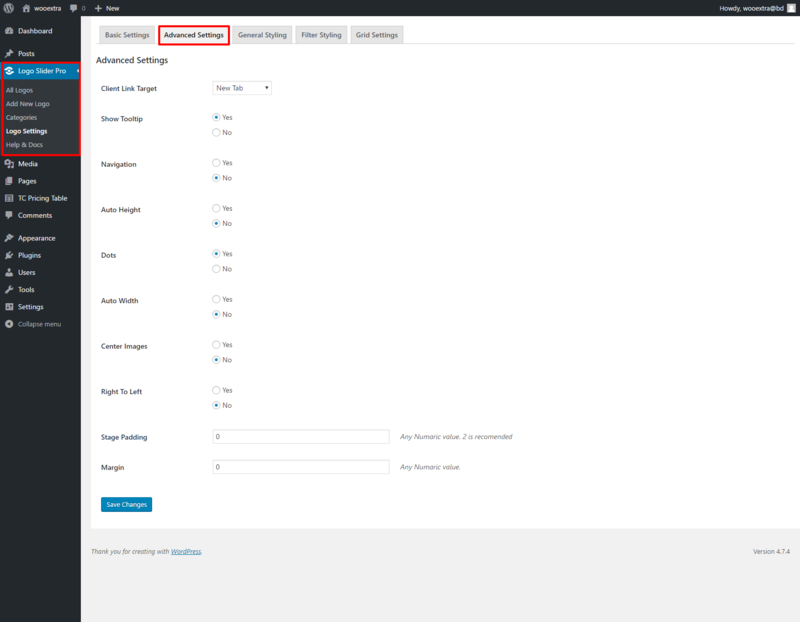 Logo Admin Setting Option available only at PRO version. At Advanced instructions added with each field. 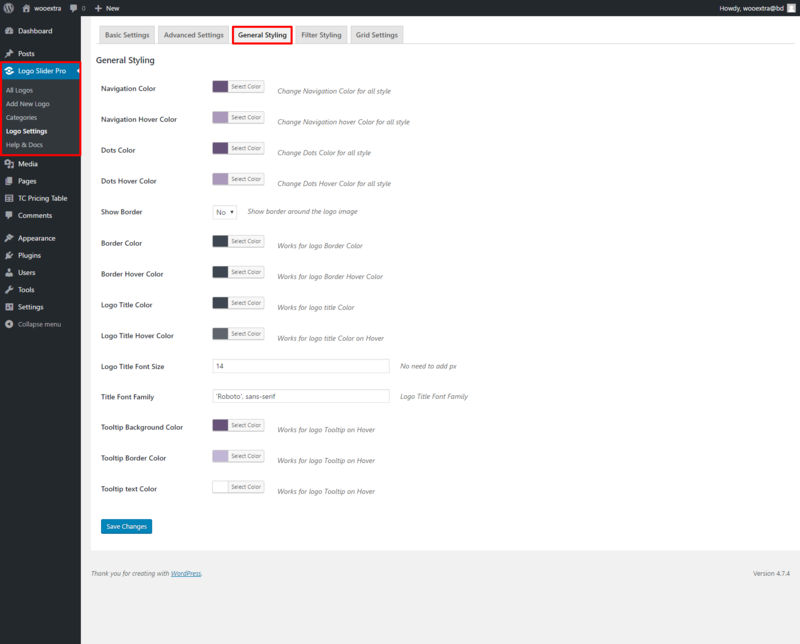 Logo Admin Styling Setting Option available only at PRO version. At Basic Settings instructions added with each field. Logo Admin filter Styling Setting Option available only at PRO version. At Basic Settings instructions added with each field. 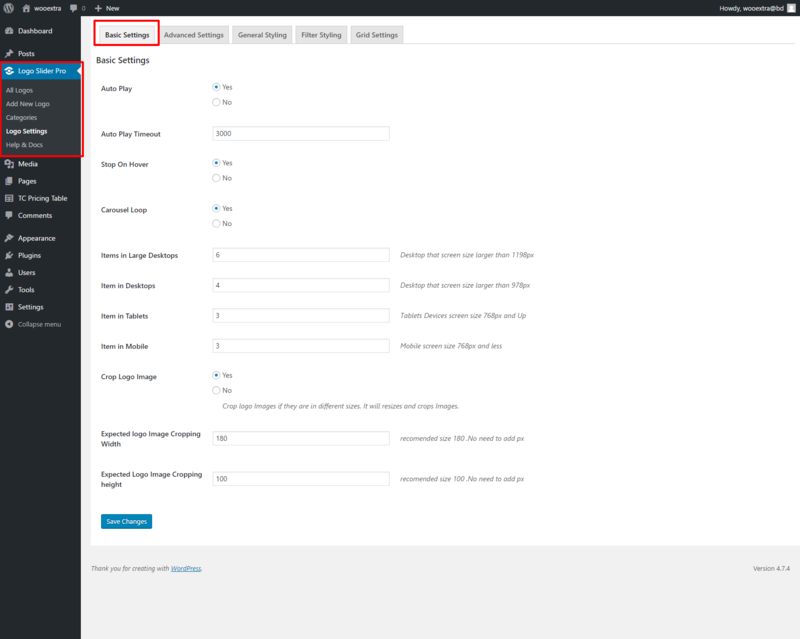 Logo Admin grid Styling Setting Option available only at PRO version. At Basic Settings instructions added with each field. 1 logo_cat All Logo Category Slug Go to TC Logo Slider > Category. Here you will find Logo category names & all the slugs.